This image depicts our expanded plan for the One Stop Family Pop Up in 2018. 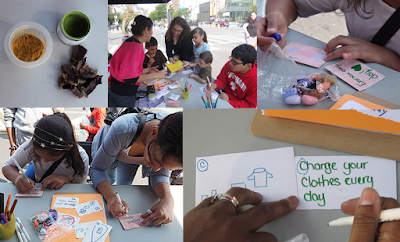 We are planning to host the project at family-events in NYC Parks and public spaces. The exhibit will have two walled tents, 10x10 feet each. A guest artist will be stationed at one tent. There, the parent artist will hold an art show and workshop that relates to family living. 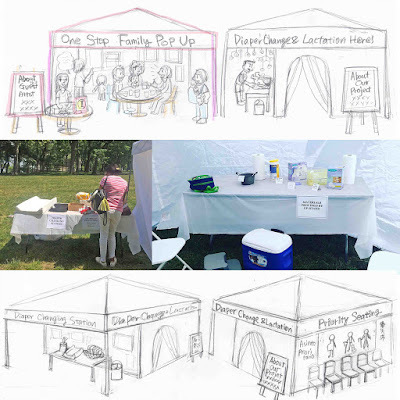 The other tent will be a private lactation tent near a diaper changing station. There will be a priority seating area as well. People can use diapers, wipes, hand sanitizer, manual breast pumps, lactation pads, etc. as needed. These are accommodations that all families need but are still not publicly provided in our community. When made available, they enable people to stay and enjoy events for a much longer period of time rather than rushing home to breastfeed, pump, or change a diaper. Our awareness initiatives celebrate maternal health and serve to improve access for pregnant women and parents. We will also hold workshops so that people can make a lasting commitment to being family-friendly. For example, at a pin making workshop, participants may create slogans like, “Pregnant? Take my seat” or "I support breastfeeding" to wear on their shirts, hats, or bags to display their support in public on an ongoing basis. We will give small business owners in the community our “Breastfeeding Welcome Here” and “Priority Seating” signs to put on their doors or in their windows. DeborahWasserman held an interactive salad-making workshop entitled, “Your Body is a Temple”. Passerbys gazed at beautiful, natural, and clean greens at the table. 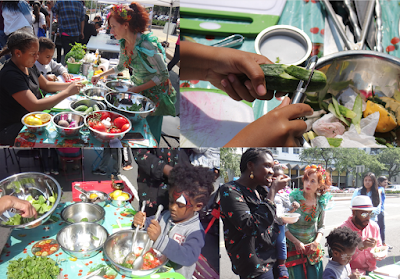 The artists led people in making salads with fresh ingredients and sharing them with each other. YasuyoTanaka held a “Health Karuta(Cards)” workshop and introduced safe, natural plant colors onto paper, along with felt pens and crayons. Participants drew a health catchword and its image on cards. A WS like this one helps us to share ideas about our health while playing together.